I am settling nicely into my rest and recuperation phase. Phillip was home most of each day on Friday through Sunday. We ordered groceries online and he picked them up and put them away. He’s really stepping up to the plate and taking over my household chores. Sitting up straight and standing both hurt, a pulling on the incision, but slouching on the couch or laying down are fine. I’m doing some limited slouching at the computer. I feel pretty strong, but last night I made soup for dinner and it completely knocked me out. So now I know my limits. I’m sleeping just fine, friends are coming to visit, and life goes on. Happy to be here! 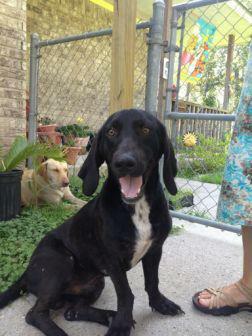 This is Sue’s newly adopted basset/labrador mix Eli, aka Huggy Bear. What a cutie! And this is without a doubt the funniest beagle video I’ve ever seen. Enjoy! Warning #1: you might have this song in your head all day. Warning #2: there’s a lot of barking, in case your beagles are listening. Clearly I should stick to photography (not videography) but here is just a little taste of Stanley meeting Moses on Thanksgiving.